Apache Spark is gaining traction as the defacto analysis suite for big data, especially for those using Python. Spark has a rich API for Python and several very useful built-in libraries like MLlib for machine learning and Spark Streaming for realtime analysis. Jupyter (formerly IPython Notebook) is a convenient interface to perform exploratory data analysis and all kinds of other analytic tasks using Python. In this post I’ll show step-by-step how to set up a Spark cluster on OpenStack and configure Jupyter with multi-user access and an easy-to-use PySpark profile. To get a Spark standalone cluster up and running, all you need to do is spawn some VMs and start Spark as master on one of them and slave on the others. They will automatically form a cluster that you can connect to from Python, Java and Scala applications using the IP address of the master node. Sounds easy enough, right? But there are some pitfalls, so read on for tips on how to avoid them. Save this as init-spark-master.sh for use with the OpenStack command line client. The script first adds some firewall rules to allow access to the different components and installs the OpenJDK dependency. Next, a Spark tarball is downloaded, unpacked and made available under /opt/spark on the host. The tarball is prepackaged with Hadoop v1 libraries (note the “hadoop1.tgz” suffix), so adjust this if you need Hadoop v2 instead. The only configuration of Spark we need at this point is to set the options “spark.deploy.defaultCores” and “spark.executor.memory”. They are used to configure how much resources each application will get when it starts. Since the goal is to set up a multi-user environment with Jupyter notebooks, we need to limit the total amount of CPU cores and RAM that each notebook will use. Each notebook is an “application” on the cluster for as long as the notebook is active (i.e until it is shutdown by the user). If we don’t limit the resource allocation, the first notebook created will allocate all available CPU cores on each worker, leaving no CPU cores free for the next user. In addition, the default RAM allocation for each app is only 512 MB on each worker node, which might be a bit too small, so we bump that up to 2 GB. The echo line adds “spark-master” to /etc/hosts with a reference to the IP address of the VM. Spark tries to resolve the local hostname on startup. Without a resolvable hostname you might encounter “Name or service not known”-errors, resulting in Java exceptions and exits. On the last line the Spark master process is started. The master process is given the IP address of the local host as an argument to make sure it binds to the correct interface. The IP address is extracted from the output of the “ip addr” command. If you rather prefer using the web UI (Horizon), you could just as easily paste the Cloud-init script into the text box on the Post-Creation tab of the Launch Instance dialog and archieve the same result. As expected there are no workers alive yet, so let’s initialize some. To do so we use a slightly modified version of the Cloud-init script above. The main difference is the startup command, which is now /opt/spark/sbin/start-slave.sh with the address to the master as the only argument. Remember to adjust the variables below to your IP range and master IP address. 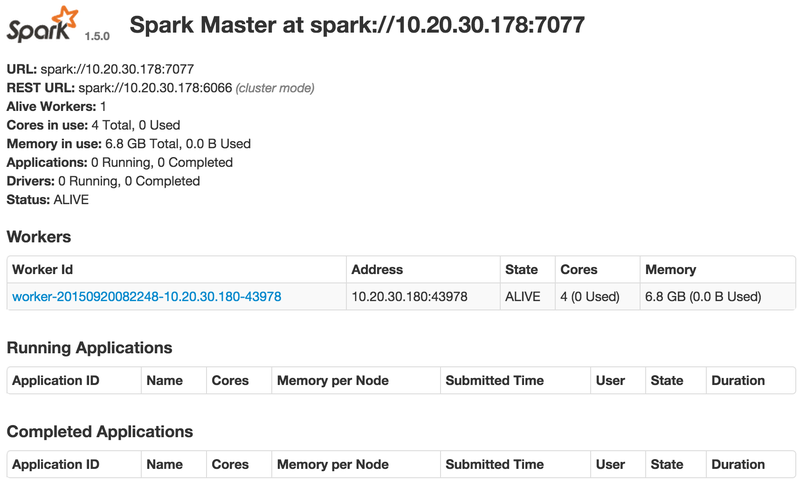 Verify that the new worker nodes show up in the Spark master UI before continuing. A shiny new Spark cluster is fine, but we also need interfaces to be able to use it. Spark comes prepackaged with shells for Scala and Python where connection to a cluster is already set up. The same level of usability is possible to get with Jupyter (formerly IPython Notebook), so that when you open a new notebook a connection to the Spark cluster (a SparkContext) is established for you. The SparkContext is available through the variable “sc” in the notebook, ready to use by calling sc.textFile() to create an RDD, for instance. JupyterHub is a multi-user server for Jupyter notebooks. That makes it possible for several users to use Jupyter independently and have their own notebooks and files in their home directory instead of a shared storage directory for all notebooks. However, this requires that each user has a user account on the VM where JupyterHub is running. Add user accounts for relevant users now if needed. JupyterHub uses unix authentication, meaning that it relays the username and password to the underlying authentication system on the VM for credential check. In this deployment JupyterHub is installed on the Spark master VM and launched there. It could run on a separate VM, but there is normally no need for that since the Spark master process does not require that much resources. The VM where Jupyter notebooks are executed are called the “driver” in Spark, and that will require some processing power and memory use, depending on the use case. Now try to open the JupyterHub login page on the floating IP address of the VM and log in. After login you should be greeted with an empty home directory with no notebooks. A new notebook can be created by clicking “New” on the right above the notebook list. If you create a new notebook, you’ll notice that the only supported kernel is Python3 at the moment. We need to add PySpark to that list to be able to use the Spark cluster from Jupyter. It might seem odd to install ipython[notebook] as a dependency, but the reason is that IPython/Jupyter contains a number of Python support modules that kernels rely on. Previously when we installed using pip3, we got the Python3 versions of those modules. When installing again with pip, we get Python2 versions. PySpark depends on Python2. This kernel definition ensures that the Spark built-in “pyspark-shell” is started under the hood as the process where our code will be executed. 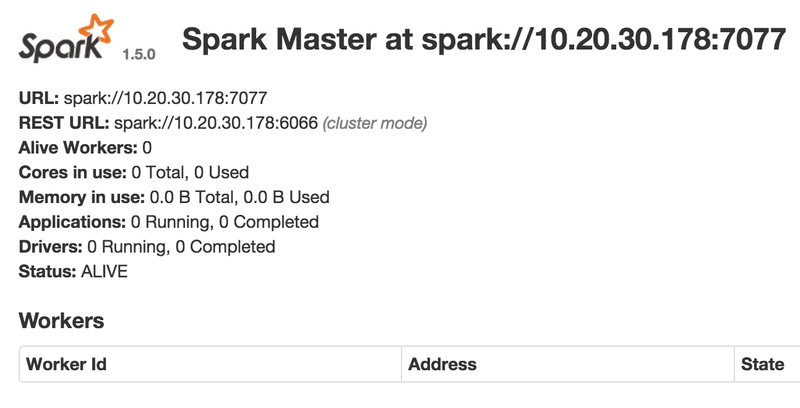 Notice how the address to the Spark cluster, “spark://10.20.30.178:7077”, is sent as an argument. Remember to customize that address to your specific environment. The address references the Spark master VM (the same host as Jupyter runs on), but could just as easily reference an external host. For instance if you wanted to setup Jupyter on a separate OpenStack VM, or if you already have a Spark cluster running somewhere else that you want to connect to. The Spark master UI shows the right URL to use to connect, right below the Spark logo. Note that the Spark workers depend on being able to establish connections back to the host where the driver process runs (the Jupyter notebook), which may not be possible depending on the firewall setup when connecting to a remote Spark cluster. This is the reason a firewall rule allowing all traffic on the local network (10.20.30.0/24 in my case) is added by Cloud-init on all the Spark VMs. After adding the kernel definition file for PySpark you’ll have to refresh the Jupyter homepage to see the new kernel in the list. No need to restart JupyterHub. [W 2015-09-20 20:31:39.295 ubuntu kernelmanager:52] Kernel 8a0b760d-357a-4507-a18b-da4bebd09e3f died, removing from map. This error occured because I hadn’t installed ipython[notebook] using pip yet, so the Python2 modules needed by PySpark were not available. Notice how the error message states that it is /usr/bin/python2 that reports the error. Jupyter tries to restart the kernel a total of five times, but hits the same error every time and eventually gives up. In the notebook UI this is shown as a “Dead kernel” message. Other errors can pop up in the Spark logs on master or worker nodes. Spark logs to /opt/spark/logs, so have a look there if anything is malfunctioning. The Spark master node logs every new application that is started on the Spark cluster, so if you don’t see output there when opening a new notebook with the PySpark profile, something is not right. Remember to use Python2 when starting the shell. The above command mimics what Jupyter does behind the scenes when a new notebook is created. This error can pop up in the log output of the interactive Python Spark shell or Jupyter (formerly IPython Notebook) after starting a PySpark session and trying to perform any kind of Spark action (like .count() or .take() on a RDD), rendering PySpark unusable. After this change my PySpark shell was limited to 4 CPU cores of the 16 CPU cores in my cluster at that time, instead of reserving all available cores (the default setting). However, even though the Spark UI now reported there would be enough free CPU cores and memory to actually run some Spark actions, the error message still popped up and no Spark actions would execute. errors in each executor's log file. The second of these was causing this error in my case. The host firewall on the host where I ran my PySpark shell rejected the connection attempts back from the worker nodes. After allowing all traffic between all nodes involved, the problem was resolved! The driver host was another VM in the same OpenStack project, so allowing all traffic between the VMs in the same project was OK to do security-wise. The error message is not particularly useful in the case where executors are unable to connect back to the driver. If you encounter the same error message, remember to check firewall logs from all involved firewalls (host and/or network firewalls). On a side note, this requirement of Spark to connect back from executors to the driver makes it harder to set up a Spark cluster in a secure way. Unless the driver is in the same security zone as the Spark cluster, it may not be possible to allow the Spark cluster workers to establish connections to the driver host on arbitrary ports. Hopefully the Apache Spark project will address this limitation in a future release, by making sure all necessary connections are established by the driver (client host) only. Over the last weeks I’ve dived into data analysis using Apache Spark. Spark is a framework for efficient, distributed analysis of data, built on the Hadoop platform but with much more flexibility than classic Hadoop MapReduce. To showcase some of the functionality I’ll walk you through an analysis of Twitter data. The code is available as an IPython Notebook on Github. The question I want to answer using Spark is: What topics are people currently tweeting about? The people are in this case the ones I follow on Twitter, at the moment approx. 600 Twitter users. They represent a diverse set of interests mirroring the topics I’m interested in, such as data analysis, machine learning, networking technology, infrastructure, motor sports and so on. By extracting the hashtags they’ve used in tweets the last week and do a standard word count I’ll generate a list of the most popular topics right now. The amount of functionality for data analysis in Spark is impressive. Spark features a long list of available transformations and actions, such as map, filter, reduce, several types of joins, cogroup, sum, union, intersect and so on. In addition, Spark has a machine learning library with a growing number of models and algorithms. For instance does Spark MLlib include everything needed to do the Linear Regression example I did on AWS in my previous blog post. Spark also comes with a Streaming component where batch analysis pipelines easily can be set up to run as realtime analysis jobs instead. Compared to classic Hadoop MapReduce Spark is not only more flexible, but also much faster thanks to the in-memory based analysis. Each tweet was saved to a local MongoDB instance for persistence. The loop first checks the database to see if that user has been processed already, to save time if the loop has to be run several times. Due to rate limiting of the Twitter API it took about 2 hours to download the dataset. By the way, the term “friends” is the word Twitter uses to reference the list of users that a user follows. The code snippet above depends on a valid, authorized API session with the Twitter API and an established connection to MongoDB. See the IPython Notebook for the necessary code to establish those connections. Of the dependencies the Python modules “tweepy” and “pymongo” need to be installed, preferably using pip to get the latest versions. In the code snippet above I use sc.parallelize() to load a Python list into Spark, but I could just as easily have used sc.textfile() to load data from a file on disk or sc.newAPIHadoopFile() to load a file from HDFS. Spark also supports use of Hadoop connectors to load data directly from other systems such as MongoDB, but that connector unfortunately does not support PySpark yet. In this case the dataset fits in memory of the Python process so I can use sc.parallelize() to load it into Spark, but if I’d like to run the analysis on a longer timespan than one week that would not be feasible. To see how the MongoDB connector can be used with Python, check out this example code by @notdirkhesse which he demonstrated as part of his excellent Spark talk in June. “sc” is the SparkContext object, which is the object used to communicate with the Spark API from Python. I’m using a Vagrant box with Spark set up and “sc” initialized automatically, which was provided as part of the very interesting Spark MOOCs CS100 and CS190 (BerkeleyX Big Data X-Series). The SparkContext can be initialized to use remote clusters running on EC2 or Databricks instead of a local Vagrant box, which is how you’d scale out the computations. Spark has a concept of RDDs, Resilient Distributed Datasets. RDDs represent an entire dataset regardless of how it is distributed around on the cluster of nodes. RDDs are immutable, so a transformation on a RDD returns a new RDD with the results. The last two lines of the code snippet above are transformations to filter() the dataset. An important point to note about Spark is that all transformations are lazily evaluated, meaning they are not computed until an action is called on the resulting RDD. The two filter statements are only recorded by Spark so that it knows how to generate the resulting RDDs when needed. The first filter transformation is called on allTweetsRDD, which is the RDD that represents the entire dataset of tweets. For each of the tweets in allTweetsRDD, the lambda expression is evaluated. Only those tweets where the expression equals True is returned to be included in tweetsWithTagsRDD. All other tweets are silently discarded. The second filter transformation is a bit more complex due to the datetime calculations, but follows the same pattern as the first. It is called on tweetsWithTagsRDD, the results of the first transformation, and checks if the tweet timestamp in the “created_at” field is recent enough to be within the time window I defined (one week). The tweet timestamp is parsed using python-dateutil, converted to unixtime and compared to the precomputed limit. What’s happening here is that I’m creating a new Pair RDD consisting of tuples of (hashtag, count). The first step is to extract all hashtags with a flatMap(), and remember that every tweet can contain a list of multiple tags. A word count is the “Hello World”-equivalent for Spark. First, each hashtag is transformed to a key-value tuple of (hashtag, 1). Second, all tuples with the same key are reduced using the lambda function, which takes two counts and returns the sum. Spark runs both map() and reduceByKey() in parallel on the data partition residing on each worker node in a cluster, before the results of the local reduceByKey() are shuffled so that all values belonging to a key is processed by one worker. This behaviour mimics the use of a Combiner in classic Hadoop MapReduce. Since both map() and reduceByKey() are transformations, the result is a new RDD. To actually perform the computations and get results, I call the action takeOrdered() with a cursom sort function to get the top 20 hashtags by count. The sort function simply orders key-value pairs descending by value. In this list it’s easy to recognize several of the interests I mentioned earlier. 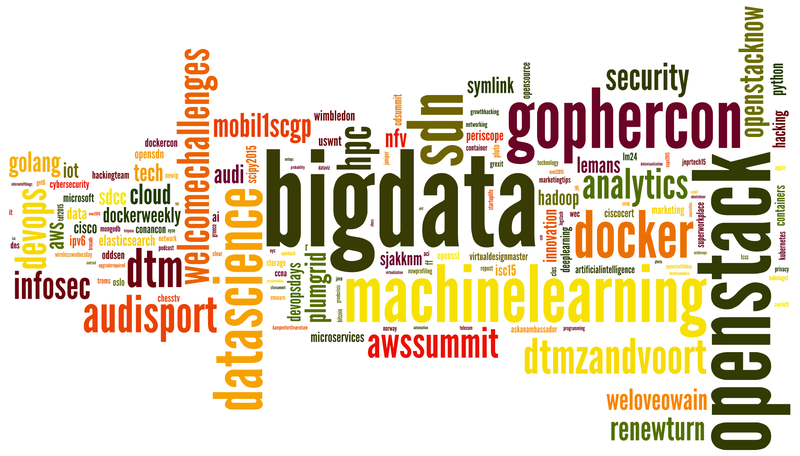 Big Data is the top hashtag, which together with Machine Learning and Data Science make up a significant portion of the interesting tweets I see in my Twitter timeline. OpenStack is another top hashtag, which is a natural topic given my current job in infrastructure. SDN is a closely related topic and an integrated part of the OpenStack scene. Docker is taking over in the infrastructure world and the DevOps mindset that follows with it is also a popular topic. What’s interesting to see is that conferences spark a lot of engagement on Twitter. Both GopherCon and AWS Summit turn up in the top 20 list since they took place during the week of tweets I analyzed. The same goes for motor sports (hashtags DTM Zandvoort, Audi Sport, Welcome Challenges), although in that case it’s the professional teams, in contrast to conference goers, that make sure their Twitter followers are constantly updated on standings and news.